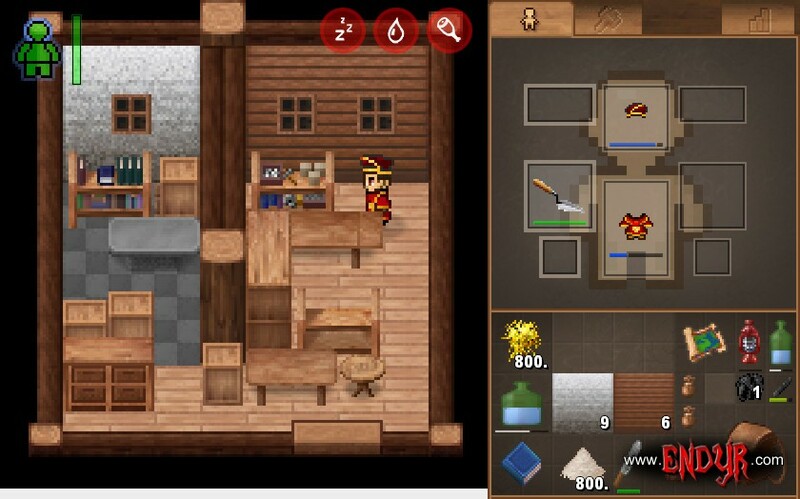 Players can now build houses and place furniture inside. Furthermore a lot of new items have been added and the interface was given a context menu for easier access. Finally you may now signup to receive the Endyr newsletter to get informed about upcoming tests and releases. One of the more important features in Endyr is building a house. This is achieved by chosing a blueprint, finding a nice spot somewhere in the world and then provide the resources needed. For example, a simple straw hut will need a lot of wooden boards, girders and -of course- straw. Storage room: Inside your hut you may place shelves, drawers, chests, etc. to store items and resources. 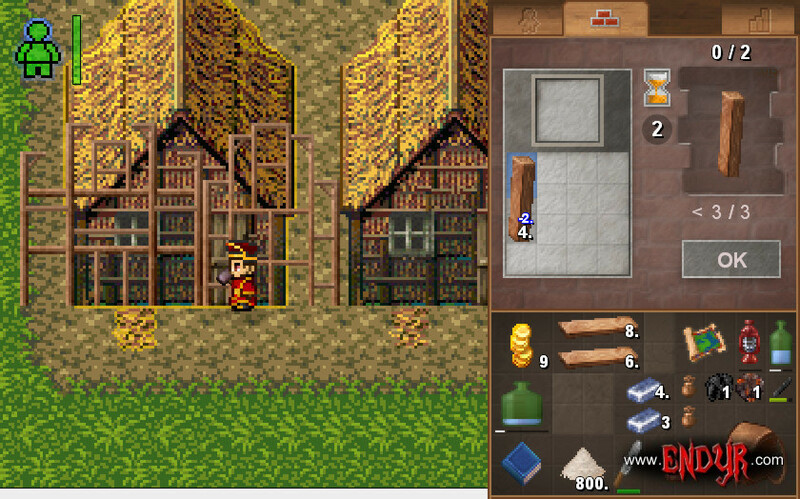 While you could place your furniture outside they'd be easily lootable by thieves and monsters. Workspace: Besides furniture you may also place an oven, anvil, workbench, drawing board or whatever you need. Working "at home" is safe and lets you access all the stored resources mentioned before. Customization: If you don't like the default style you may change floors and walls to your liking. Or just place expensive stuff and rare items to impress your visitors. Protection: This is not implemented yet but houses will protect you from enemies. Socializing: Building a house together and using it as a home base is always a nice thing. Or maybe you like to invite other players for a chat? Talk about how to take over the world while enjoying a cup of coffee together (each house is like a private chatroom). 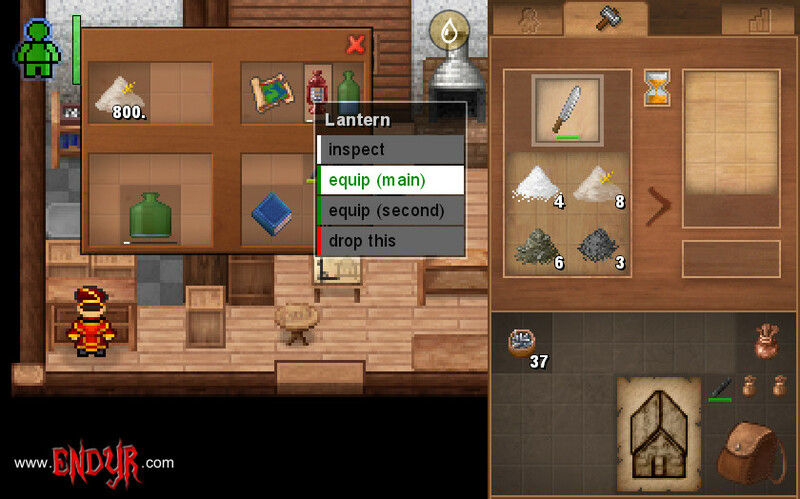 Game content: All the items mentioned before, as well as the furniture and the house itself need to be built by players. This means more work for carpenters, woodcutters, stone masons and everyone included in the work chain. 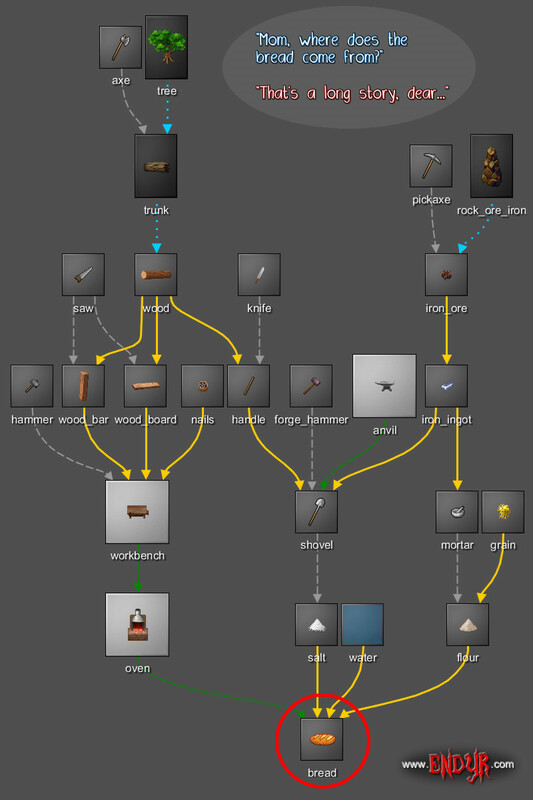 On top of that the context menu may display custom actions for individual items, like for example the lamp's light intensity setting (where brighter means faster oil drain) or the flame effect of a flaming sword. Are you waiting for the next alpha / beta / release? You may now signup your e-mail to get informed about upcoming tests (no spam, no ads, only release dates). Please visit www.endyr.com for more details and the signup form. Make sure to receive and click the activation link. Note that this is NOT the account registration but only a newsletter. Hoping to keep you eager! Why browser, why not with installation on the PC ? Simply because I don't want to limit players to a specific device. Endyr runs on every browser, from PC to Mac to Linux to Android and other Smartphones or Tablets. I love platform independance and modern browsers offer enough performance to display the graphics as seen in the screenshots. Furthermore, as you already stated, there's no installation and thus no waiting time, no downloads, no updates and no patches either - just login and play. For me, it doesn't matter too much if its in fullscreen, downloaded onto my PC, or if its on my browser. As long as the game is good it shouldn't matter.